Raman spectroscopy is mainly used in chemistry and mineralogy to determine the chemical and molecular structures of a sample in three dimensions. To do this a laser beam is directed at the sample. Most of the light beam passes into the material and a small part is diffused. By analysing the diffused light and detecting peaks at certain wavelengths (distinct from the wavelength of the incident beam) the chemical composition of the sample can be deduced. 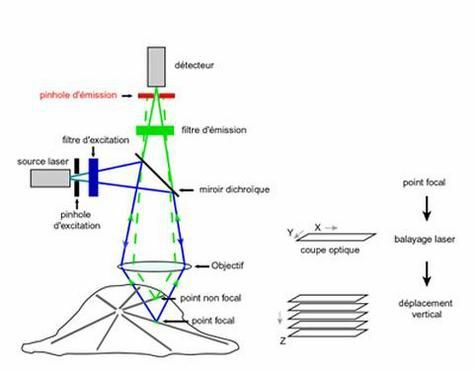 Diagram of a confocal laser scanning microscope.